Can you explain how you ended up working with silicone? As a child I was very creative and was encouraged by my mother and grandmothers who were very talented knitters and seamstresses. I also did a lot of mark making and painting and had a dream of going to art school - textiles seemed the obvious road to follow. I studied Woven Textiles at Glasgow School of Art and experimented with woven silicone and wire there, especially after I was sponsored by a company who were able to provide me with the material. I was always interested in man-made fabrics and more industrial materials, particularly transparent ones. I was fascinated with plastics as well as rubber silicone and was the odd one out on the course as I was against anything traditional or floral. I used to make visual references to scientific images and circuit boards and was always excited by the more industrial side of textiles, rather than the traditional ‘crafty’ side. 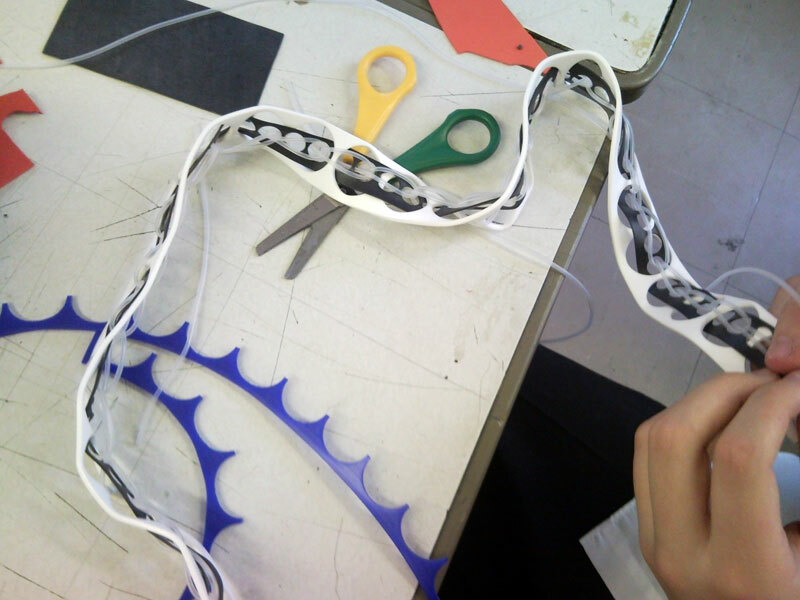 How did you discover the silicone off-cuts which you now use in your work? I then did a post-graduate course at Central St Martin’s in London called Design for Textile Futures. It was really liberating as I learnt that anything could be counted as a textile and I really thrived on that knowledge, but it wasn’t until I found a pile of off-cuts at a factory skip that I realised this was the material I wanted to work with. I took a big bag of them back to college and thought there must be something I can do with this. I couldn’t believe that such a wonderful material was just being thrown away. Why are you so attracted to the silicone off-cuts? I love re-using and working with rubber silicone off-cuts as it’s really difficult to re-cycle silicone, so working with the actual off-cuts is a much better solution and stops so much material going in the landfill. Also I love the feel of the material, it’s really tactile and feels great. During my final year at St Martin’s I realised I could use them to develop a range of lighting. I had always been fascinated with transparency and the way light shines through coloured and textured materials, so silicone lighting sculptures seemed like the perfect direction for me. What other products do you make alongside lighting? I still produce lighting sculptures and rugs to commission but mainly make smaller pieces like key rings and jewellery which are more accessible and affordable. I was inspired to start making accessories at my first Cockpit Arts Open Studios event after seeing people’s reactions to my samples. Customers were picking up pieces and putting them round their necks, asking if I made jewellery, and that’s when I realised there was a market for Re-silicone accessories. Do you make larger scale pieces as well? 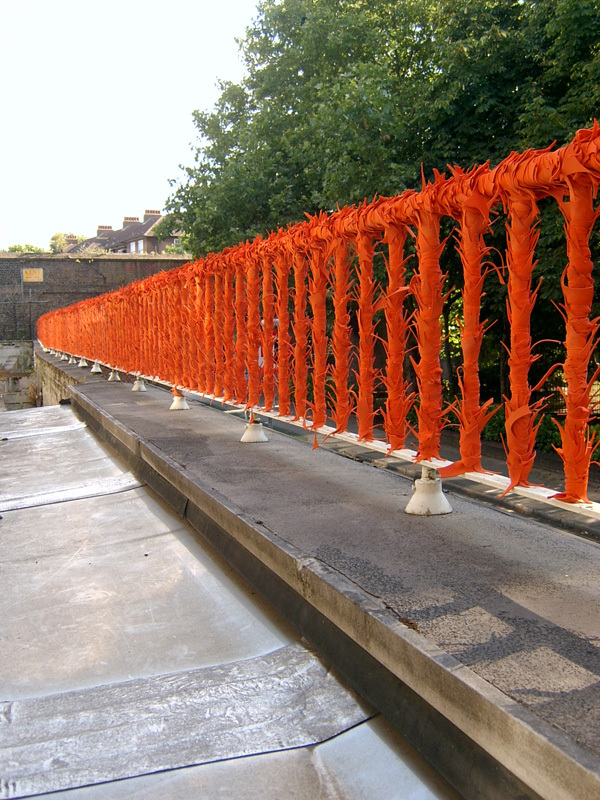 I love creating large-scale installation pieces, especially in outdoor and public spaces. My main passion is preparing things that people can touch, walk past and enjoy. 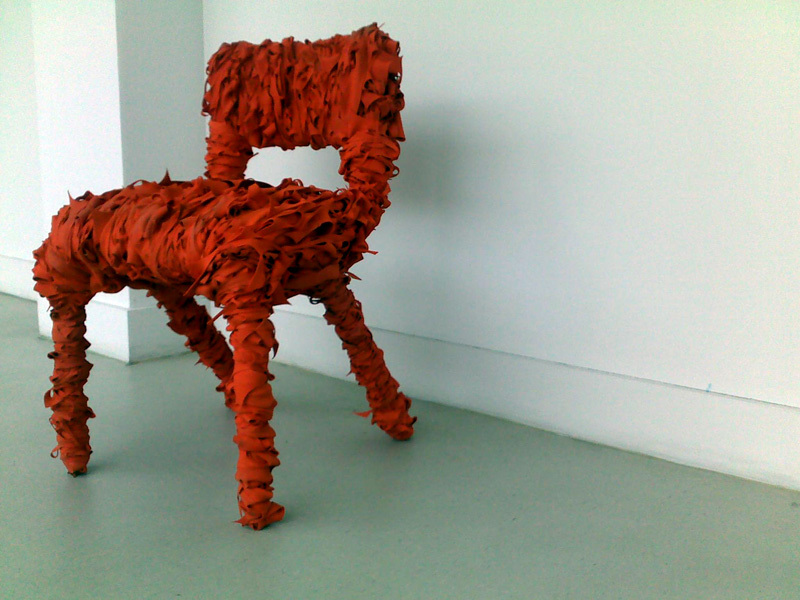 I use the orange rubber off-cuts from a traditional hairbrush manufacturer for my installations. It’s a fantastic material to work with on a big scale as there’s a guaranteed stream of it. Do you design your pieces before you start the making process? No, I never sit down and design on paper, I’m very hands-on. I feel more comfortable and inspired when experimenting with the material and exploring all the possibilities for shapes and construction techniques. I get sent all sorts of off-cuts by the factory – different shapes, colours and thicknesses – and that’s great as I never know what I’ll get which means I’m constantly developing new products. It keeps me fresh. How important is the re-cycling element in your work? I’m proud of the fact that I’m not just being creative and making things, but am using materials that otherwise would be land-filled. There is an educational side to my work as people are not necessarily aware of industrial waste and its implications for our environment. I don’t think the re-use element should be the main reason people buy my jewellery; I would like them to enjoy the products and their tactile properties with the eco-friendly aspect being an added bonus. You lead a lot of workshops (including one for the Making on Sunday 1st August 2010), how do these fit in with your other interests? Workshops are a big part of my practice and link directly in with it. I couldn’t sit all day making one product in my studio as I like doing a bit of everything and having different projects on the go – it’s what I thrive on. I speak to really interesting people at the workshops and get lots of new ideas - I think it’s important to share information and skills with others. I love making key rings with the public; it’s something anyone can do and I find it interesting to see how people react with the materials and what shapes and colours they come up with. I run workshops for outpatients at Great Ormond Street Children’s Hospital and find it amazing to see how such a simple technique can inspire and occupy the children and their parents – it’s made me really passionate about the workshops.